Minimalism is an art movement that started in the 1950s that consists of the use of simple objects and colours in design. Nowadays, more and more designers and architects incorporate the movement’s ideas into fashion and interior decoration. Minimalism exists in the clothing industry everywhere from catwalks to everyday outfits. Minimalism on clothing usually includes the use of single geometric shapes or the repetition of two-tone colour schemes. The sheer simplicity of the style makes minimalist clothing very popular these days. Unlike many accessories in today’s fashion world, minimalist accessories are not as fancy. Instead, they are typified by the use of single colours and geometric shapes. Watches, for example, are simplified as much as possible. They usually contain no numbers, and sometimes even the presence of the watch hands are reduced to a minimum. Just like clothing and accessories, minimalist architecture uses a lot of geometric shapes, particularly rectangles and squares. Minimalist architecture gives a sensation of the futuristic and organised, while remaining very pleasing to the eye. Elements of minimalism can be implemented in your home as well. This can be through the use of simple colour themes in your kitchen or the use of simple, repetitive geometric patterns. Moreover, minimalistic wall stickers and paintings are popular of their simplicity and the peaceful atmosphere they can help cultivate. As a result minimalist wall stickers are a great way to decorate without overloading the senses. 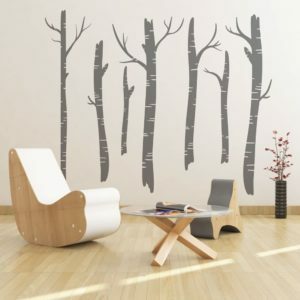 Here are some great examples of wall stickers that can achieve this minimalist effect in your home. All three wall stickers are made of matte vinyl which reduces glare from light reflections, building an minimalistic sensation and add to the interior design. They consist of simple structures that are refreshing to the eyes. This entry was posted in Art & Design and tagged interior design.